Bermudian actor Earl Cameron recently celebrated his 100th birthday, but that hasn’t stopped him from continuing his legendary career as he gets set to star in BBC Radio 4′s adaption of Neil Gaiman’s novel ‘Anansi Boys’. According to the Radio Times, the six-part drama also stars Lenny Henry as Anansi/Mr Nancy, “an arachnid trickster god” first introduced in Gaiman’s book American Gods [and later depicted by Orlando Jones in Amazon's hit adaptation earlier this year] as well as Game of Thrones’ Jacob Anderson and Misfits’ Nathan Stewart-Jarrett who will play his wayward sons Charlie and Spider. “I’m delighted to have this amazing cast of actors bring Anansi Boys to life for Radio 4,” Gaiman said at the series’ press launch. “Anansi Boys started for me over 20 years ago when Lenny Henry and I were working on [the original TV version of] Neverwhere together. “When I was writing the novel I had Lenny’s voice in my head and I’m delighted that in this dramatisation Lenny is Mr Nancy and Anansi the Spider – to me he is inseparable from this project. 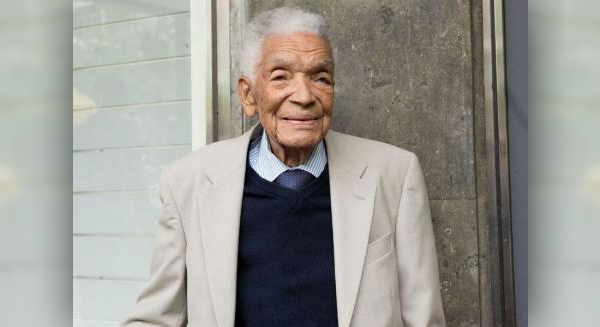 Earl Cameron celebrated his 100th birthday in August this year, marking a century in the life of one of the island’s most illustrious thespians. He has appeared in films ranging from the Bond movie Thunderball in 1965 to Inception alongside Leonardo DiCaprio in 2010 and broke barriers by becoming the first black actor to have a leading role in a British movie when he starred in Pool of London in 1951. ‘Anansi Boys’ will run for a total of three-and-a-half hours – with a half-hour show every day at 11.30pm from December 25 to 29, and an hour-long climax on December 30 at 2.30pm. For more information regarding the Radio 4 series click here. This is amazing! A fantastic actor doing a great book! And representing Bermuda so well, as he’s always done.